Episode 54 - Krishna returns from his mission to Hastinpur with war on his mind. Yuddistira, having spent the last 12-14 years undergoing massive hardship to prevent this war, is reluctant to accept this truth. He begs for more information, trying to find any way out of this situation. So Krishna obliges by giving us the details of a few more speeches made in the Kuru court, but none of it helps. War is truly inevitable. So both sides round up their armies and march on Kurukshetra. When they arrive, each side appoints a Commander in Chief. It is Bhisma on the Kaurava side, and King Drupad on the Pandavas' side. From this point until the end of the war, the main narrative frame of the story will be told in terms of a conversation between Sanjay and Dhrtarastra. The Epic has so far not explained how it is that Sanjay knows what is going on at the far-off battlefield, but somehow he knows everything, and is able to relate it all to his king. Occasionally, Dhrtarastra will interrupt with questions or react to the events, so it will be through his blind eyes that we shall perceive the coming war. But don't be deceived that just because we are on the eve of war, that we will be soon getting to it. The Epic always takes its time, and there will still be quite a few more episodes before the action really starts. 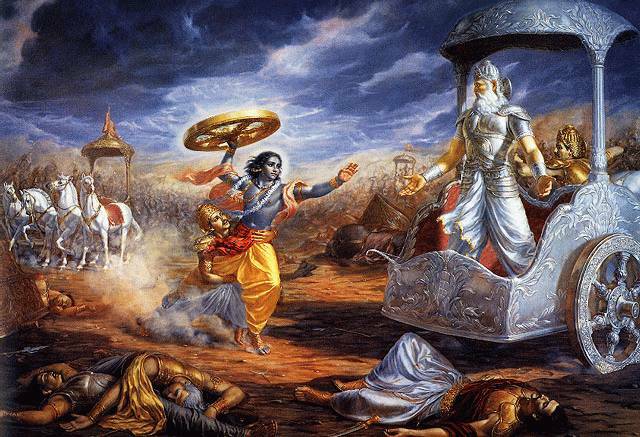 After al, we still need to get through the Bhagavad Gita!! !